It may seem obvious, but there really is nothing more integral to your look than your smile. It is a huge part of what makes you who you are, instilling confidence in you and giving others a gateway to your personality. Healthy teeth and gums are the basis for that smile, and for your overall dental health. In order to get the nutrients you need out of your food, you must have healthy, properly aligned teeth and a normal bite. If you fear that something is wrong with your bite or you smile, we can help. Do not let these problems linger, as they can put you at a higher risk for other medical issues. Dental Extractions, and the treatments to replace your missing teeth: bridges, dentures and implants. You, the patient, are our primary concern. Our goal is to get your smile back on track and to keep it healthy and bright. We know that some patients are not comfortable going to the dentist. For those that feel this anxiety, we also offer sedation dentistry to put you at ease while we get to work. Sedation techniques can include “Laughing Gas” or intravenous sedatives to put you at ease. We also know that you are busy. That is why we work around your schedule, featuring extensive office hours and walk-in appointments. We also offer a 24-hour answering service, because we know a dental emergency will not wait for a convenient time to strike. We will work with you to make your payment option as easy as possible. 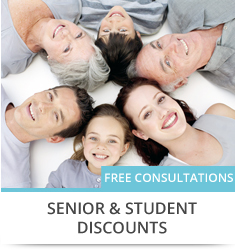 We also offer discounts for students, families and senior citizens. If you think you need some form of dental treatment, give us a call today. We offer free consultations, so please, do not hesitate to get your oral health back on the right track.